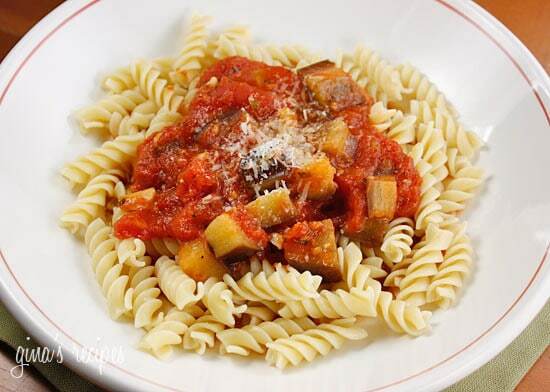 When you are in the mood for a vegetarian meal, this is a nice quick weekday dish. I like to use extra virgin olive oil, it gives this sauce a nice flavor. 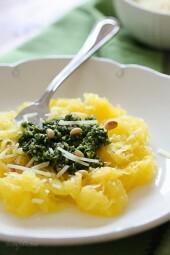 Top with good grated cheese and enjoy over high finer or whole wheat pasta. In a large deep frying pan, saute garlic in olive oil. 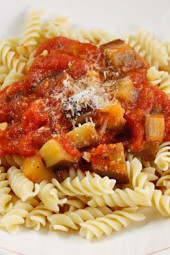 Add eggplant and saute about 2-3 minutes. Coarsely chop tomatoes and add to the pan. Season with salt and pepper and simmer, uncovered about 15-20 minutes. Add fresh chopped herbs and toss with pasta (extra points). This is SO GOOD! I just had it for lunch with grilled chicken. How is it 4 SP, though? Did you count the grated cheese you suggested? Made this for dinner tonight & it was amazing! I had some leftover Gina marinera sauce & added a can of diced fire roasted tomatoes with fresh sliced mushrooms. Thanks again Gina!!! Love you! Hi Gina, I live in Mexico and I haven't seen Tuttorosso products here yet. I also prefer doing sauces from scratch, I think its healthier 🙂 Do you have any tips on how to make this type of sauce? Thanks a lot, I'm a big fan! do you peel the eggplant first? No, I use the whole eggplant. This looks so good! I have an eggplant I desperately need to use. 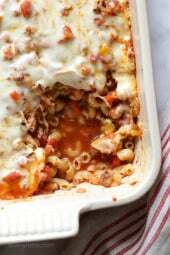 I think I'm going to try this but instead of putting over pasta put it over some ground turkey meatballs! I've got some eggplant fresh from our garden. I was looking for a healthy recipe & will make this tonight! 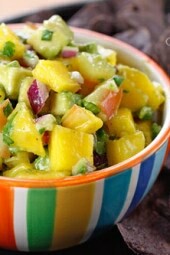 making this right now.. looks delicious. can't wait to try 🙂 thanks gina! This was amazing! Instead of using pasta, I tossed in some shrimp at the very end and then served this alongside some fresh steamed carrots. Wholly yum! me loves pasta! Nice!